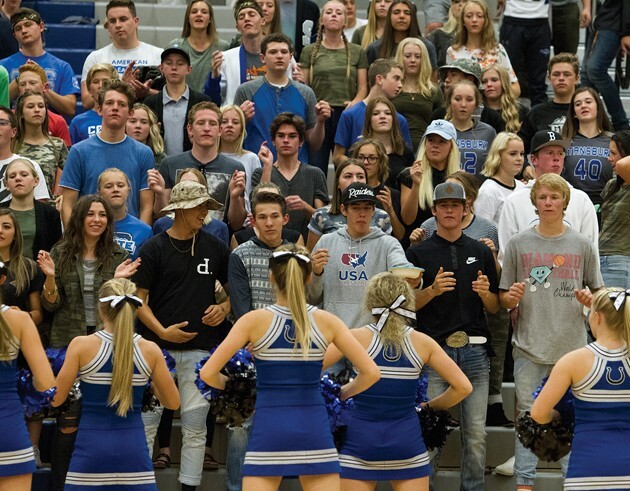 Stansbury High cheerleaders perform to the student body during a recent volleyball match. As of Oct. 1, the school district enrollment growth hit 13 percent from last year. 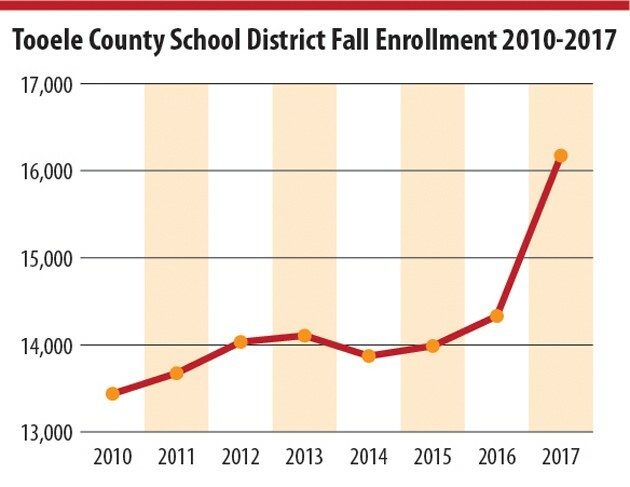 Enrollment in Tooele County School District is up, even after the opening of a new charter school this fall. The school district’s unofficial Oct. 1 head count shows that enrollment grew by 1,842 students — or 13 percent — from 14,332 in 2016 to 16,174 in 2017. Superintendent Scott Rogers reviewed the Oct. 1 enrollment report with the Tooele County School Board during its Oct. 10 meeting. The 13 percent growth is the largest growth in enrollment in at least the last 25 years. Prior to this fall the largest growth rate was 7.4 percent in 1999. Bonneville Academy, a publicly-funded charter school located in Stansbury Park, opened this fall with an enrollment of 630 students. Its students are not included in the school district’s enrollment report. 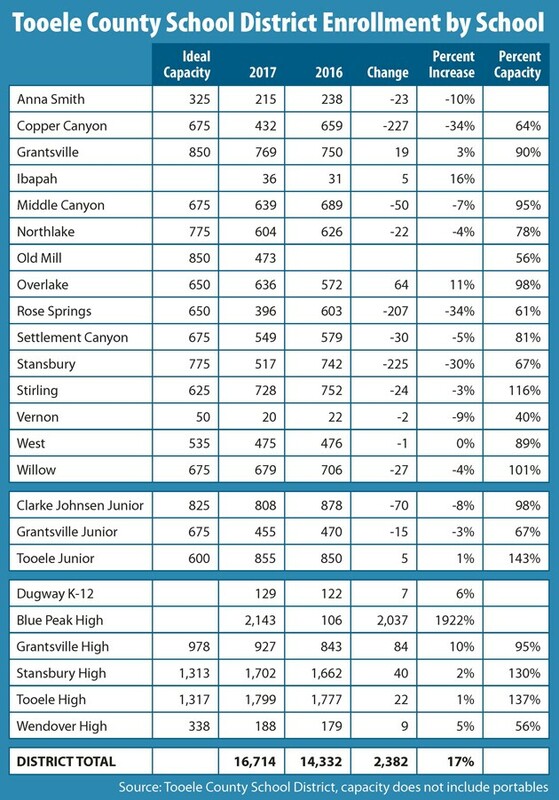 The school district’s enrollment dipped by 1.7 percent in the two years that the other charter schools in Tooele County — Excelsior Academy and Scholar Academy — opened. Responsible for a lot of the growth was the debut of Tooele County School District’s online program, called Blue Peak Online, according to Rogers. Blue Peak Online is a kindergarten through 12th grade program offered by the school district in conjunction with My Tech High, a Spanish Fork-based online education provider. A total of 170 of Blue Peak Online students are from Tooele County, the remaining students come from 28 Utah school districts. Prior to starting Blue Peak Online, the school district had over 100 students enrolled in other school district’s online schools. The largest enrollment in Blue Peak Online, by grade, isn’t at the high school level, but at the opposite end of the grade spectrum. There are 298 students enrolled in Blue Peak Online’s kindergarten. While anticipating the opening of Old Mill Elementary in the Benson Gristmill area, the school district redrew boundaries for Stansbury Park neighborhood schools. Stansbury Park Elementary opened the 2017 school year at 67 percent of capacity, compared to 96-percent capacity in 2016. Rose Springs Elementary started out 2016 at 93 percent capacity. According to the Oct. 1, 2017 report, the school is at 67-percent capacity for 2017. Old Mill Elementary’s inaugural student body of 473 students puts it at 56 percent of capacity. Lake Point, which sends students to Stansbury Park, and Stansbury Park are the fastest growing areas in Tooele County, according to data from the county. Last spring the Tooele County School Board considered moving the Spanish dual language program from Middle Canyon Elementary to Copper Canyon Elementary, because Middle Canyon was already over its ideal capacity. The district postponed the decision to move the Spanish program, and instead opted to close the boundaries of Middle Canyon to all out-of-boundary students, except siblings of dual language students. Middle Canyon opened 2017 with 50 less students then it had in 2016. 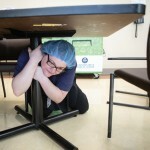 The school’s 639 students as of Oct. 1 put the school at 95 percent of its ideal capacity. 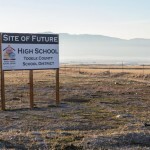 Rogers noted that both Tooele and Stansbury High schools are over their capacity and charter schools have plans to expand to include junior high students. 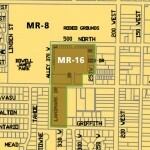 “It looks like the next need for a new building might be a high school,” he said. While the school district’s enrollment is up by 13 percent for the 2017-18 school year, that won’t mean more per pupil funding from the state until the 2019 school year. The formula for state per pupil funding uses the average daily enrollment of the previous school year.